The Friuli-Venezia Giulia region offers many possibilities for outdoor activities: climbing, hiking, paragliding, canyoning, rafting, horse riding, golf, mountain biking and cycling. Fans of spelunking will be glad to discover that the region is home to the world's largest tourist cave: the Grotta Gigante located in the municipality of Sgonico, on the Italian side of the Trieste Carso. The seaside offers possibilities for water activities such as sailing, swimming, surf, wind-surf and kitesurf. Snow sports include downhill, off-track and cross-country skiing, freeride, snowboard, snow parks, ice-climbing, outings with snow-shoes and sleddogs. 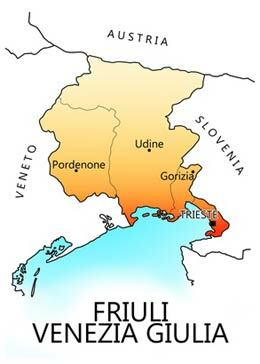 Friuli-Venzia Giulia lies at the most north-eastern part of Italy, forming the border with Austria and Slovenia to the east, with the Veneto region to the west, taking in the Carnic Hills in the north, and the bustling Adriatic port of Trieste to the south. Noteworthy are also the busy town of Udine and the Roman town of Aquileia. 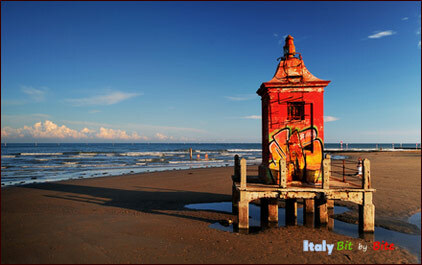 Grado and Lignano Sabbiadoro are famous seaside resort towns. Popular are also the Lagoons of Grado and Marano Lagunare. San Daniele del Friuli is known as the production center of the San Daniele ham (prosciutto), and every summer at the end of June there is the Aria di Festa, an event about ham. Aquileia is an ancient Roman city, at the head of the Adriatic at the edge of the lagoons. The adriatic sea resorts: Lignano Sabbiadoro, Grado, Marina Iulia di Monfalcone, Riviera di Barcolana. The alpine ski resorts: Ampezzo, Chiusaforte-Sella Nevea, Claut, Forni di Sopra, Forni Avoltri, Malborghetto-Valbruna, Piancavallo, Pontebba-Passo Pramollo, Ravasletto-Zoncolan, Sauris, Tarvisio, Verzegnis-Sella Chianzutan. 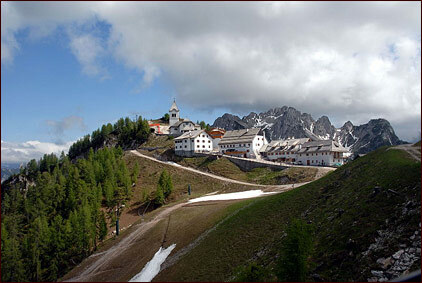 The Regional Parks: Dolomiti Friulane and Prealpi Giulie. The alpine lakes: Vajont, Barcis, Tramonti, Cornino, Verzegnis, Cavazzo, Doberdo, Fusine, Predil. The caves of Sgonico Grotta Gigante, Villanova di Lusevera, Pradis di Clauzetto. The "Road of Wine and Cherries", the "Road of Ham and Castles", the "Road of Montasio Cheese". 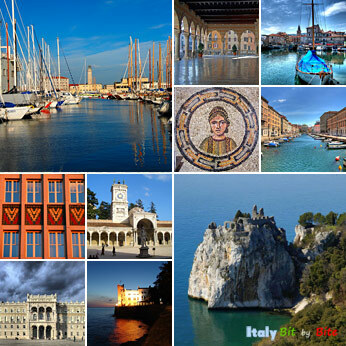 Photo credits (top to bottom): Friuli-Venezia Giulia collage made by Italy bit by bite from photos by: Alessandro Comuzzi (Muggia), antonychammond (Trieste harbor), adryelettric (Miramae castle), il conte de luna (Trieste piazza dell'unita), Sandra Schachner (Udine piazza della liberta'), Sebastià Giralt (Aquileia mosaic). Lighthouse at Lignano Sabbiadoro © Vincenzo De Santis/ Fotolia.com. Monte Santo di Lussari by Johann Jaritz.